This installment is about deconstructing dragons. 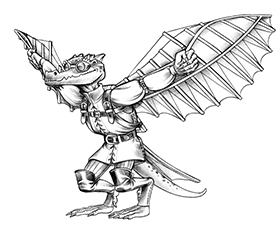 The Monster Manual contains 20 chromatic dragons, 20 metallic dragons, 1 shadow dragon, and 1 undead dragon. The Tome of Monsters and the Southlands Bestiary introduce several more. With all those stat blocks spread over three books, you’d expect to find plenty of variety—and you’d be right. But even with all that variety, streams of predictability flow through every* dragon stat block. * Through the chromatics and metallics, anyway. 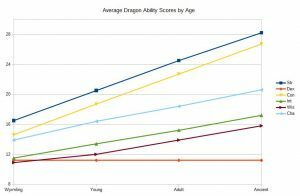 The dracolich and shadow dragon are exceptions because they don’t subdivide into age categories, so I’m ignoring them in this analysis. 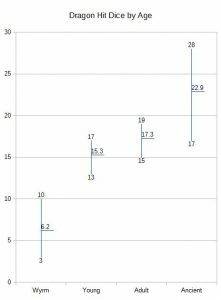 The main fountain of consistency is how the dragons’ ability scores improve as they age. The easiest way to see this is, as usual, with a chart. 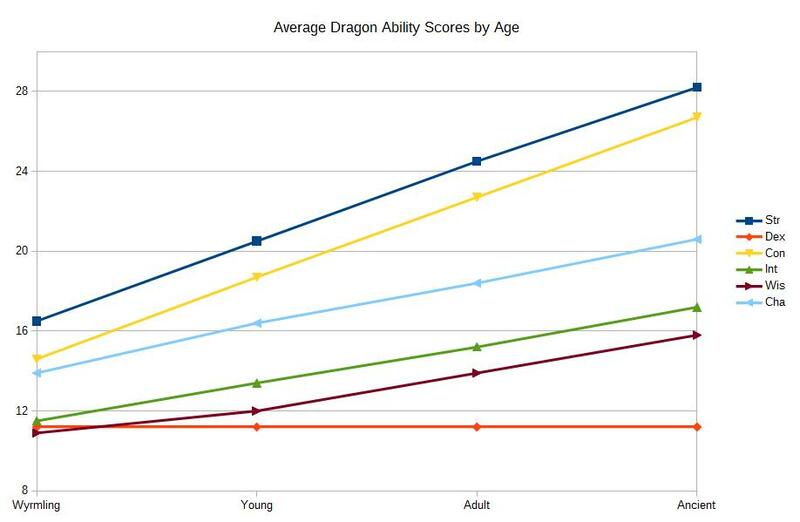 These lines represent the average values of dragon ability scores (chromatics and metallics) by age category. 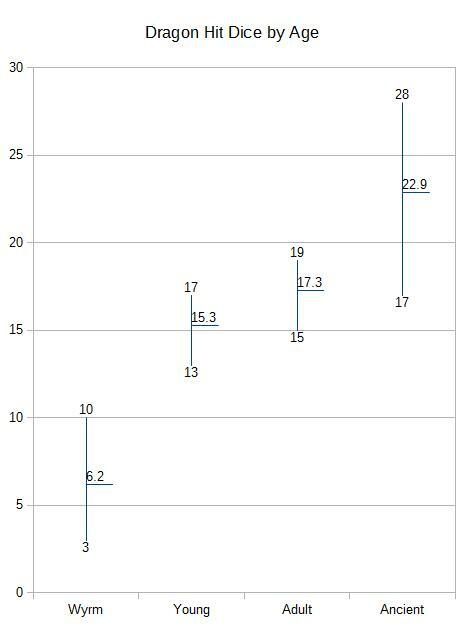 The remarkable aspect of this chart is how straight those lines are. Only the Dexterity line is perfect, but these plots come as close to perfection as you’re ever likely to see from data in the wild. Although this isn’t always the case, these straight lines are ringing echoes of intelligent design. Strength and Constitution increase by 4 at every age category. Strength increases by only 3 in three cases (adult to ancient red, gold, and silver), and black dragon Constitution jumps by 5 between wyrmling and young. Intelligence, Wisdom, and Charisma increase by 2 at every age category. In a handful of cases, Wisdom increases by only 1 or not at all. Dexterity never changes as a dragon ages. An ancient dragon dies with the same Dexterity it had as a wyrmling. With this data, we can build a model, idealized dragon. Here are its ability scores. It’s notable that no dragon corresponds exactly to these average values. Right off the bat, no wyrmling in the Monster Manual has a Strength score of 16, though four of them have Str 15 and two have Str 17. Likewise, no dragon in the MM has Dex 11, but there are plenty of 10s and 12s, and the average score is 11.2. Still, these numbers represent the main line of dragon progression. If you need a quick dragon, using this grid as your template will get you off to a good start. Dragons get few skill bonuses. All of them get a Stealth bonus and a double Perception bonus. Among the chromatic dragons, only the green dragon benefits from anything more; it gets bumps to Deception, Insight, and Persuasion. Metallics fare a little better; most of them get one or two Wisdom or Charisma proficiencies along with Stealth and Perception. The examples of the green and silver dragons are worth examining. Why does the green dragon alone among metallic dragons get Deception, Insight, and Persuasion bumps? Because it’s “the most cunning and treacherous of true dragons.” Traditionally, all dragons are considered cunning and treacherous by human standards, and we’re no amateurs in those events, but only the green dragon gets this boost. Why is the silver dragon unique in getting History and Arcana bumps? It’s described as an exception among dragons for its interest in puny humans. 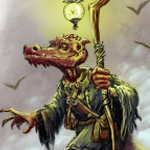 The implication is that mortal history is too brief to merit the attention of dragons (give us another 10,000 years and maybe we’ll amount to something); silver dragons alone have enough interest in our short lives to accumulate the level of knowledge that results in a proficiency bonus. The fact that only the most cunning and treacherous of dragons, or the ones that have the strongest interest in a topic, get a bonus—not the biggest bonus, but any bonus at all—is a clear indicator that fifth edition intends for designers to be very conservative about assigning skill proficiencies to dragons (and to monsters in general). If the independently designed dragons I’ve reviewed are a reliable indicator, then designers enjoy giving their dragons big Arcana and History bonuses. I see this as largely a remnant of previous edition habits. Under 3rd Edition, high-CR monsters had excessive skill points that had to go somewhere, and skills such as History and Arcana were harmless dumping grounds. In 4th Edition, skill bonuses had prescribed advances by level, the same as Hit Dice and damage. The precedent of the fifth edition Monster Manual runs against giving out such bonuses. Unless your dragon is as duplicitous as a green dragon or as scholarly as a silver dragon, it probably doesn’t merit skill proficiencies beyond Perception and Stealth. The growth of dragons’ Hit Dice from one age to the next varies more than their ability score increases and their skill proficiencies. The pattern isn’t as strong as it might appear to be; more on that below. With that said, Hit Dice tend to increase as follows. An interesting—if somewhat misleading—symmetry emerges. The multiplier between adult and ancient, on average, is half as big as the multiplier between wyrmling and young. That on average qualifier is crucial, because of the variation in the increases between dragon types. It’s best to keep these numbers at arm’s length, as you would do with a slightly unpleasant animal found on the beach, rather than embracing them like freshly bathed puppies. The second chart shows the minimum, maximum, and average number of Hit Dice for all dragon types by age category. A more useful and correct way to look at it is that a dragon’s Hit Dice increase by 100 to 200 percent (something between doubling and tripling) when it transitions from wyrmling to young, and by 25 to 50 percent when it transitions from adult to ancient. The outliers, however, can be extreme (a fact hinted at by the chart). A young brass dragon, for example, has more than 4 times the Hit Dice it had as a wyrmling; it jumps from 3 HD to 13 HD, a gain of 330 percent. A wyrmling red dragon, on the other hand, gets only a 70 percent boost when it ages to young. It also had significantly more Hit Dice as a wyrmling than any other type—twice as many, in most cases—so this probably represents the other species catching up rather than the red dragon losing ground. It turns out the red wyrmling is the hormone-charged early bloomer of dragon middle school. The jump from young to adult, on the other hand, is absolutely consistent across the board: +2 Hit Dice in each and every case. There are no exceptions. The numbers don’t explain why that’s so, they only reveal that it is. Draw your own conclusions on that score. Despite their apparent complexity with legendary and lair actions, dragons are fundamentally straightforward melee fighters. Their Armor Class, attacks, and damage comply pretty closely with the Monster Statistics by Challenge Rating table in the Dungeon Master’s Guide, when the counterbalancing effect of offensive and defensive capability is accounted for. Great breakdown, thanks for doing this. Very keen insight—the conservative use of skill proficiencies is great to know for future design. 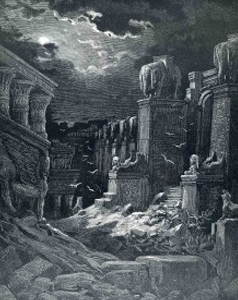 Would you please include the links to the other Howling Tower: Monster Stats, Parts 1 – 4, so they would be easier to find. It would be nice to have a link on each of the multi-part article that would take you to the first article of the series, the previous article (if it is not the first article), and the next article (when the next article becomes available) till you reach the end. Great articles, and thank you. And if I may also add it would be nice to have an icon on each page, especially the articles, that would allow you to make a nice clean print with the Kobold Press information on the bottom.